It’s no mistake, this credit card’s interest rate is 79.9 percent. The bloated annual percentage rate is how First Premier Bank, a subprime credit card issuer, is skirting new regulations intended to curb abusive practices in the industry. It’s a strategy other sub-prime card issuers could start adopting to get around the new rules. Typically, the First Premier card comes with a minimum of $256 in fees in the first year for a credit line of $250. However, a new law has capped such fees at 25 percent of a card’s credit line. In a recent mailing for a pre-approved card, First Premier lowers fees to just that limit — $75 in the first year for a credit line of $300. But the new law doesn’t set a cap on interest rates. Hence the 79.9 APR, up from the previous 9.9 percent. It’s the highest on the market and it’s the highest ever seen. The terms are eyebrow raising, but First Premier targets people with bad credit who likely can’t get approved for cards elsewhere. It’s a group that tends to lean heavily on credit too, meaning they’ll likely incur steep financing charges. So for a $300 balance, a cardholder would pay $20 a month in interest. First Premier said the 79.9 APR offer is a test and that it’s too early to tell whether it will be continued, according to an e-mailed statement. To comply with the new law, the bank said it will no longer offer the card that has $256 in first-year fees. However, customers will still be able to use their existing cards. According to First Premier’s Web site, the credit cards are issued by its sister organization Premier Bankcard. The company, based in Sioux Falls, S.D., says Premier Bankcard is the 10th largest issuer of MasterCard and Visa cards in the country, with more than 3.5 million customers. In a mailing sent to prospective customers in October with the revamped terms, First Premier writes “you might have less-than-perfect credit and we’re OK with that” — the letter notes that an online application or phone call is still required, but guarantees a 60-second status confirmation. The letter also states there are no hidden fees that aren’t disclosed in the attached form. That’s where the 79.9 percent interest rate and $75 annual fee are listed. There’s also $29 penalty if you pay late or go over your credit limit — the credit limit is $300. 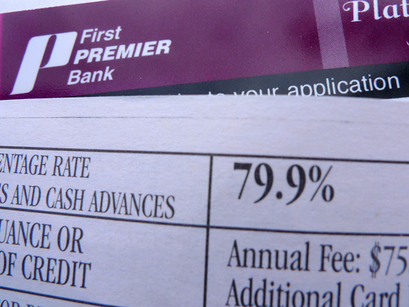 The bank did not say how many people were offered the 79.9 APR card, but noted that it needed to “price our product based on the risk associated with this market” — even if First Premier doesn’t stick with the 79.9 APR, it will likely hike rates considerably from the current 9.9 percent to offset the lower fees. The bank typically mails offers to sub-prime households, meaning those with credit scores below 700. First Premier could be cleaning up its credit card portfolio since the new regulations will limit its ability to raise interest rates. That could mean First Premier won’t issue cards as liberally to those with bad credit. As harsh as First Premier’s terms seem, that could be a blow to those who rely on the card. Even when the cost of credit is astronomical — usually because of bankruptcies — for people in true emergencies, it’s much better than not having access to credit cards.